Manu Tuilagi is the youngest of six Tuilagi brothers and is a powerful centre who is a mainstay in both the Leicester Tigers and England teams. Tuilagi represented Leicester at the Middlesex Sevens at Twickenham in 2009, but had to wait until September 2010 to make his full Tigers debut against Northampton in the Premiership. He would later scored twice in Leicester's Premiership match against Sale in December as his reputation continued to grow. Four of his older siblings, Fereti (Freddie), Henry, Alesana, known as Alex, and Anitelea, better known as Andy, have represented Samoa but Manu's allegiance lies with England. However, he had to overcome a potential visa issue in the summer of 2009 that almost saw him sent back to Samoa. His playing future was secured with a campaign on his behalf prompting a successful appeal against the Home Office ruling. He accelerated through the international age-grade ranks, earning praise for his appearances at U16s, U18s and U20s level before an injury to Mathew Tait opened the door to the England Saxons squad in January 2011. He grabbed his opportunity with both hands - scoring a try in a 45-17 rout of Italy 'A' at Sixways - and retained his place for the defeat at the hands of the Irish Wolfhounds the same month. A string of impressive performances for Leicester brought hope of further international honours but his World Cup hopes were dealt a crushing blow when he was found guilty of punching Northampton wing Chris Ashton during their Premiership semi-final match at Welford Road. A subsequent five-week ban, that runs until June 23, ruled him out of the Premiership Final clash with Saracens and the Churchill Cup. On June 20, Tuilagi was named in England's 45 man training squad for the 2011 World Cup and made his Test debut against Wales at Twickenham on August 6. The young Samoan-born centre made an immediate impact, scoring a terrific try as England beat Wales 23-19. Tuilagi was selected for England's 30-man World Cup squad and impressed on the pitch despite the team being knocked out at the quarter final stage. However Tuilagi was fined twice in New Zealand: firstly by the International Rugby Board for wearing a branded gum-shield and then by the Rugby Football Union for diving off a ferry in Auckland harbour. The latter incident also saw him warned by the police. Following the World Cup Tuilagi was sidelined with a broken cheekbone and then successive hamstring injuries that ruled him out of the start of the 2012 Six Nations. But Manu returned to the frame for the third game of the Six Nations with Wales and scored a try in the following clash against France. He kept his spot for the summer tour to South Africa and started all three Tests. 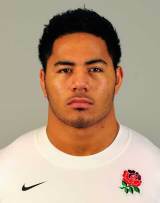 Tuilagi played a key role as England overcame the All Blacks at Twickenham during the November internationals. He then enjoyed a strong start to England's Six Nations campaign but was responsible for a couple of crucial mistakes as they lost the Six Nations decider to Wales at the Millennium stadium. As expected he was one of the 37 players selected to represent the British& Irish Lions in Australia. His hopes of breaking into starting line-up for the Test series were dealt a blow when he suffered a shoulder injury in the victory over the Reds. But his recovery and a strong performance against the Melbourne Rebels meant he came off the bench in the final Test as the Lions took the series 2-1. Come the 2013-14 season, Tuilagi made the headlines after he played a prank on Prime Minister David Cameron during a visit to Downing Street. Tuilagi apologised for the 'bunny ears' joke and Cameron laughed it off.